EDIT: This month’s Newtype reveals that as expected Akaii Meganee will be in, and also other things. ANN wrote an article about it already so I’m not gonna bother myself. All the pics were taken&posted by this nice person on Twitter. They’re from Nakayoshi Magazine and Ciao Magazine. That’s what the nice person on twitter who posted them said. 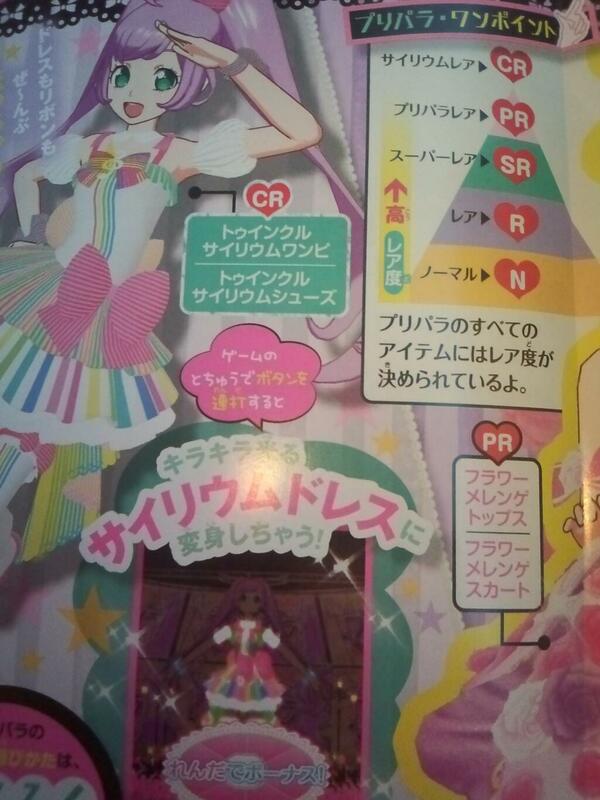 Also the nice person said Ribbon Magazine had Pretty Rhythm (arcade) stuff like usual but no Pri Para info. Most of the text on these pages is explaining the rarity system of the cards. I’m more interested in the anime than the arcade game so I’m not gonna spend too much time on things like these. Examples of clothes coordinations worn by different characters. 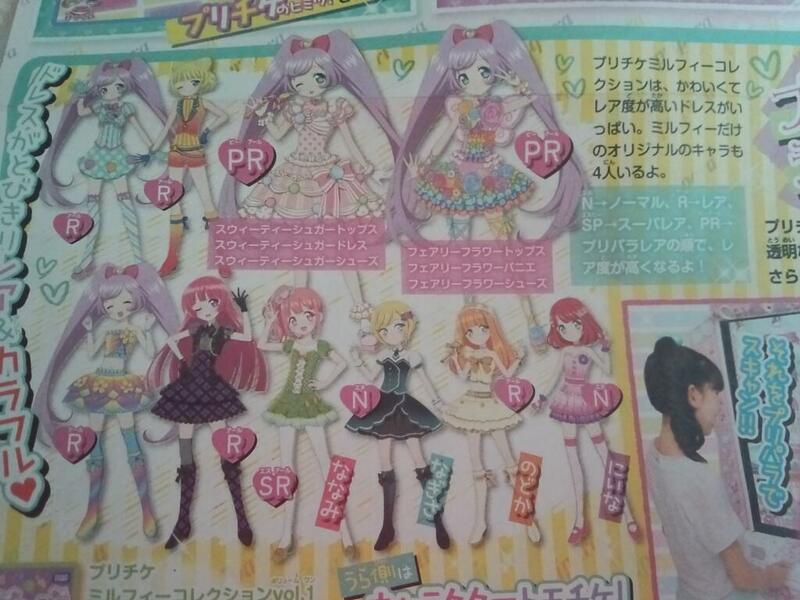 You got Laala and Sophie, then Nanami, Nagisa, Nodoka and Niina. They’re characters that will be in the arcade game. Their names all start with “N”, and they don’t really seem… distinctive, so maybe they’re just arcade fodder characters and won’t appear in the anime. I mean, they didn’t even give them family names. I think Nanami is different though. 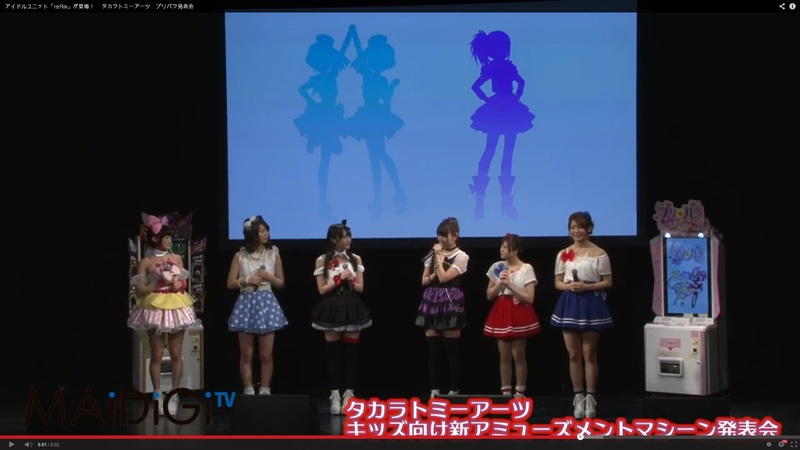 She has a side tail and her figure corresponds to the silhouette in the right they showed at Pri Para’s announcement event. The two on the left don’t look like any of the others to me. This page says that “Sophie’s in 2nd year of middle school and a cool beauty. Usually she’s calm and in a daze but her switch gets turned on when she eats umeboshi.” The switch on thing is totally a reference to Mion. So she’s the calm type, she’s definitely my favorite already. Maybe she’ll act hyperactive or something when she eats umeboshi. 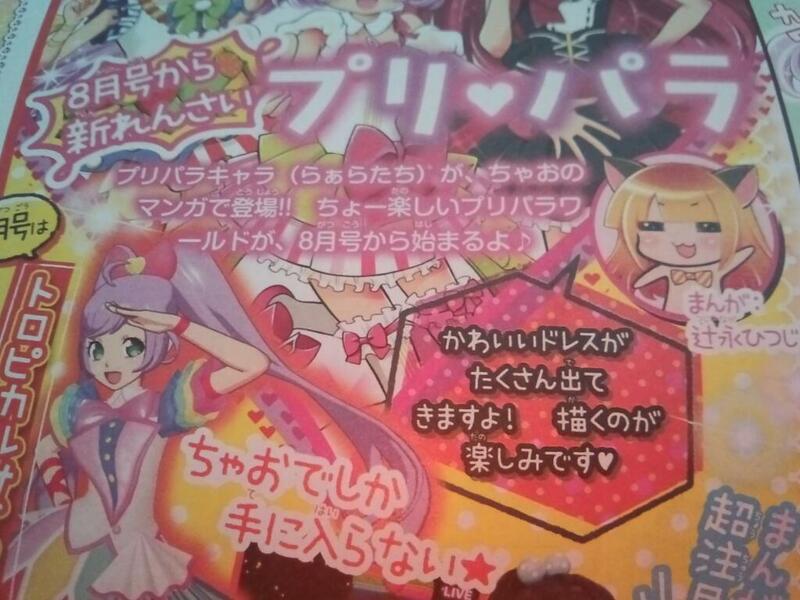 For Laala it says “A 5th year of elementary school with a lively personality. 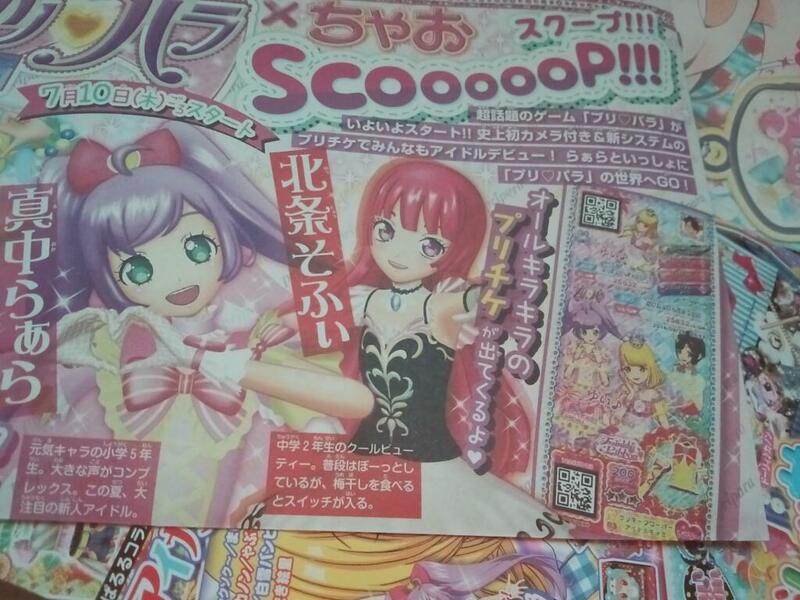 She has a complex about her loud voice.” I guess Laala’s loud voice will be what will help her becoming a good idol. Like, her special trait as the main heroine that no one else will have. I forgot if I ever invented a name for this or if there already exist a name for it. Anyway yeah my bet is her loud voice is her protagonist super ability. Think of Azuma Kazuma’s Solar Hands. Also, the blond girl in the far right has “Yai” written on her so that must be her name. She’s got a crown, but her hairstyle doesn’t match, she doesn’t have a ribbon like thing, so I doubt she’s one of the two silhouettes in the left. She seem to represent a brand by herself though so my bet is she’ll appear in the anime. 2nd pic is from this nice twitter person. 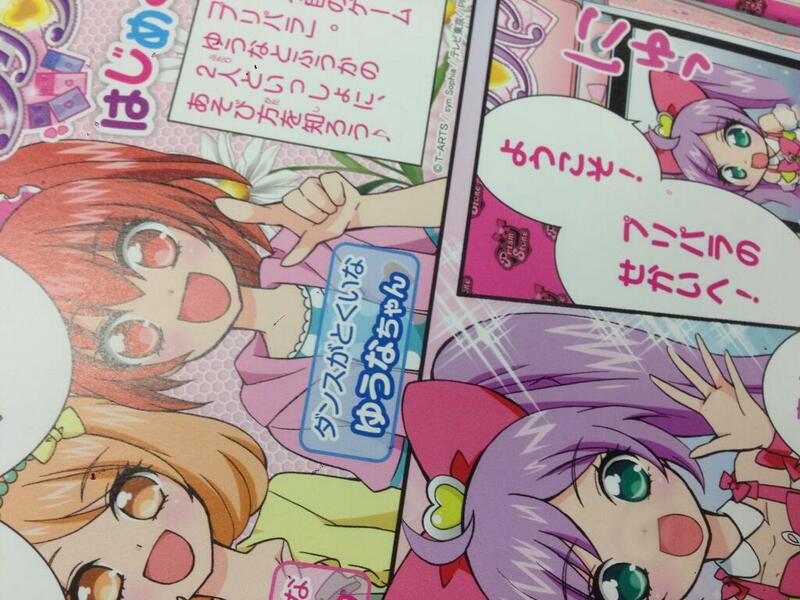 There’s also going to be a Pri Para manga in Ciao magazine. I’m not sure if it’s the same manga they announced back when they announced Pri Para or if it’s another one. Seems like it’ll feature that Yuuna girl who’s good at dancing and that Fuuka who good at something else. Yuuna also has a sidetail. There sure are a lot of characters. And they sure all seem uninspired. I don’t know what to think. I guess best guess I can make is that there will be game only and manga only chars. 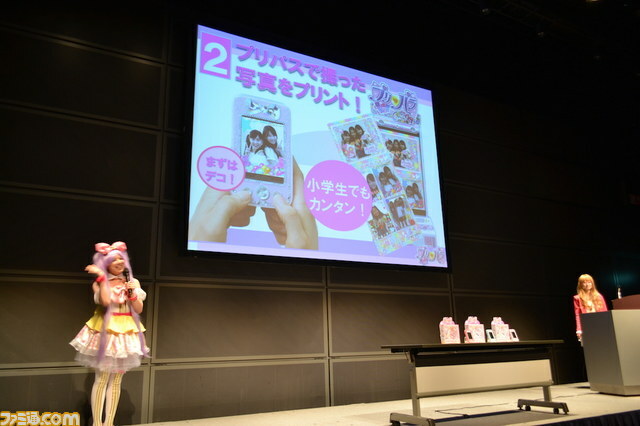 These are smartphone like toys called Pri Para Idolink. They’ll be released the 28th of August in different colors, for 9980 yen, so around 70€. Wow that’s really expensive. With it you’ll be able to take pictures, synchronize it with the Pri Para arcade game to store in the clothes etc you obtained. You will also receive mails from the different characters. It’ll be released more than a month after Pri Para’s launch so it’s definitely not mandatory to play. If you really want to get into the game however… Seriously though, 70€ sure is expensive. The guys in charge of marketing at Takara Tommy are vile foxes. At the very least it seems that little girls using it won’t have to worry about loosing their purichike as I think they can register them in the Idolink using the QR codes. Mireille: Coordinating your clothes is fun. 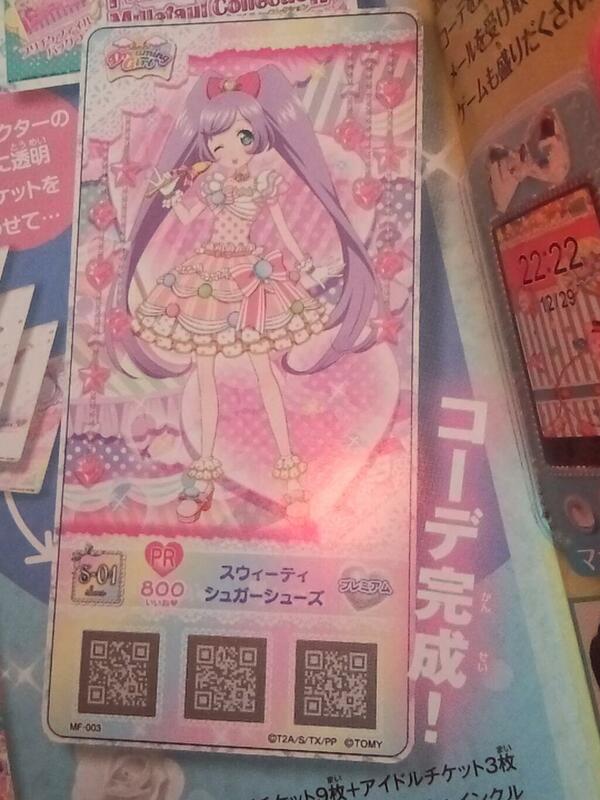 Laala: Everyone is amazing… I need to get my act together and do it too…!! Sophie doesn’t say anything like a boss. She sure is Bell like there with the rose. Saw on Famitsu. This was at the Japan Toy Awards 2014. 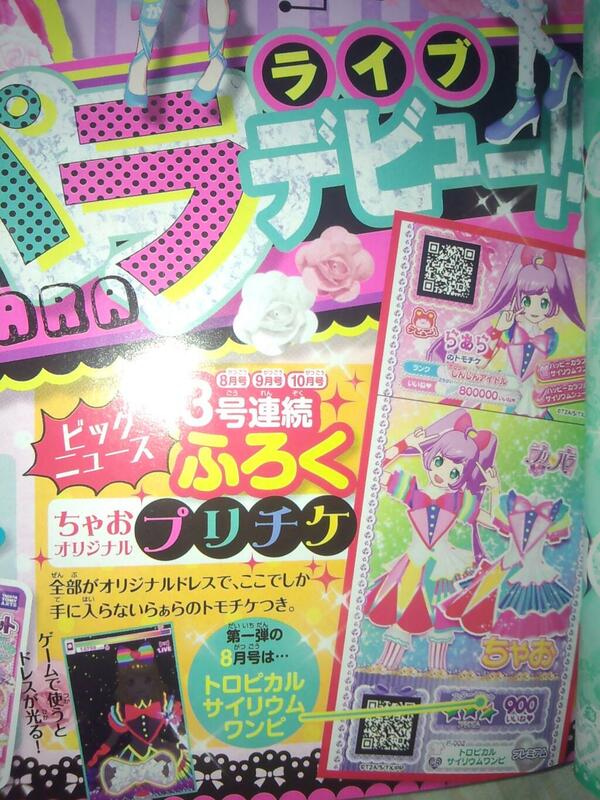 Pri Para arcade game was featured. They presented the Idolink thing. Something I only thought about now: I remember saying that maybe Pri Para won’t have romance as the girls are idols unlike Pretty Rhythm. Now that I think about it, even if they weren’t idols, it would be pretty risque to feature Laala having a romance. She’s 10 or 11 years old at most. A romance subplot featuring Sophie could be possible since she’s a teenager. In any case even if there’s no romance in the end, I hope at the very least that there will be male characters. Gonna be pretty disappointing if not. Last thing: PRASS is actually 11 episodes. Episode 9-11 are rebroadcasts of episode 50 of each season. Then replacing PRASS the 21st and 28h of June there’s gonna be a program called Pri Para School which will hype up Pri Para. It’ll feature the Prism Mates, Prizmmy and i☆Ris. It’ll be real life footage. Pri Para starts the 5th of July. 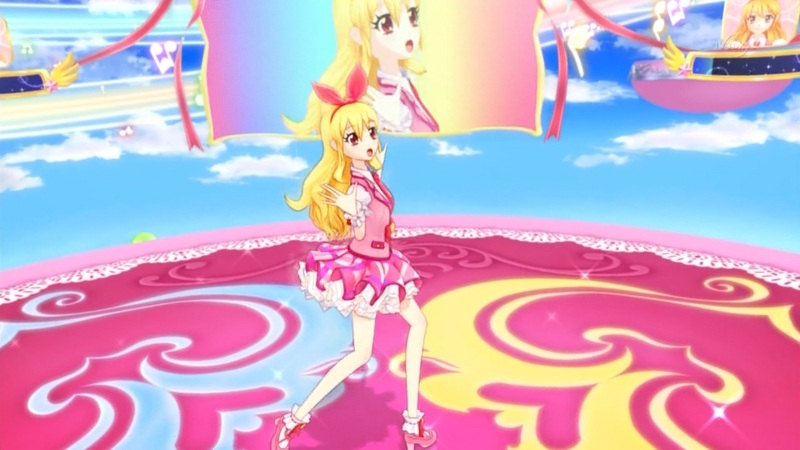 This entry was posted in Opinions on..., Pretty Rhythm, Pri Para and tagged Anime, i☆Ris, Pretty Rhythm, Pri-para, Pripara, Prizmmy, Puri Para, Takara Tomy on June 2, 2014 by rockmanshii. Besides the usual tweets from the staff and merchandise info I want to write more things about episode 43 first. Was so hyped about the Juné Vs Rinne thing I didn’t take the time to write about all the other little details of the episode. This entry was posted in Opinions on..., Pretty Rhythm and tagged Akao Deko, Anime, Densha Otoko, Getsumen to Heiki Mina, Hishida Masakazu, Kawada Kiyotaka, Otobe Yoshihiro, Pretty Rhythm, Pretty Rhythm Aurora Dream, Pretty Rhythm Dear My Future, Pretty Rhythm Rainbow Live, Takara Tomy on February 6, 2014 by rockmanshii. Aikatsu! is an anime adapted from an arcade game by Bandai. One of sunrise’s animation studio is doing it. 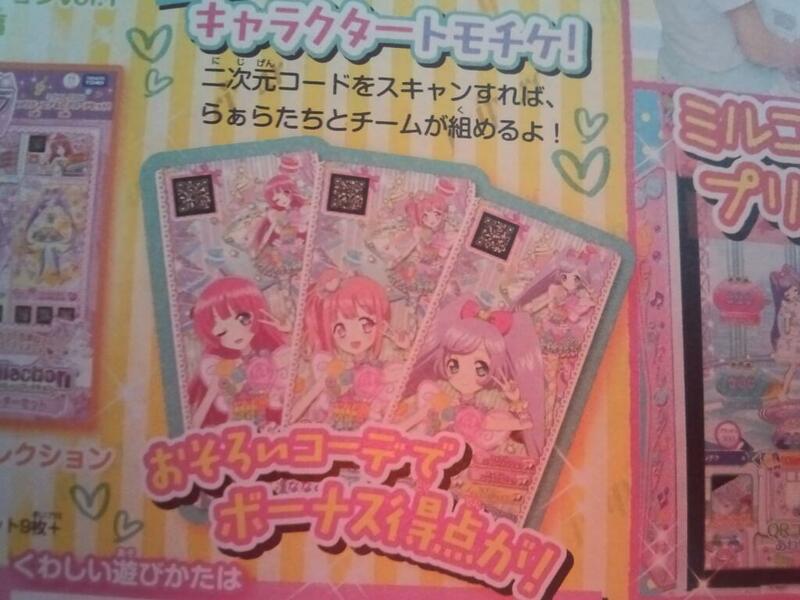 The game is aimed towards little girls and is about making your character the best idol there is, using collectibles cards representing clothes to customize her. 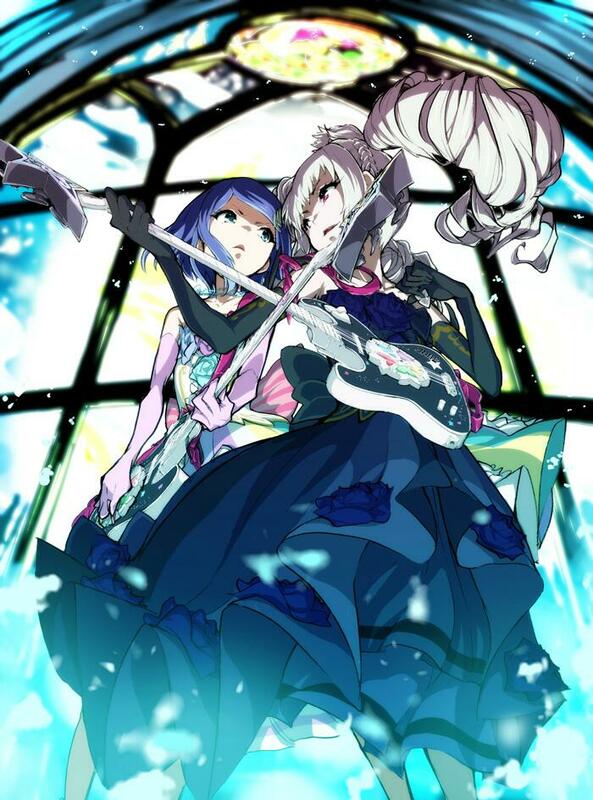 The game is quite recent; it was launched this October, right before the anime’s start. I was really interested when hearing about it as it reminded me of Pretty Rhythm. I’m pretty sure Bandai is trying to rival Takara Tomy with their own idol arcade game and ride on Pretty Rhythm’s success. About the anime, it’s typically the kind of show most people will call crap without even watching it. Now doesn’t this remind you of anything? The comparisons with Pretty Rhythm doesn’t stop here as the first episode is pretty much a copy paste of Pretty Rhythm’s initial plot. We have our heroine called Ichigo who is helping her parents run a bento store. 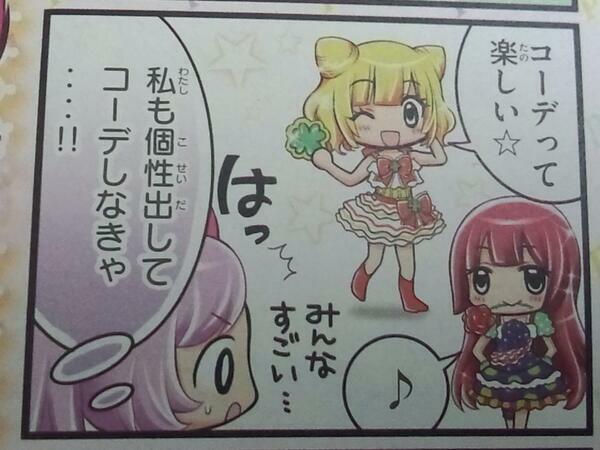 In Pretty Rhythm, Aira helps her parents with their bakery. The basic plot is the same. The clueless heroine who becomes an idol and has some hidden talent. Both shows also uses CG for the dance scenes. The CGs scenes in Pretty Rhythm are rather well done and fits in (then again I’m a huge fan of it so my judgement is biased) while I have to admit the ones in Aikatsu! just look weird. Unlike Pretty Rhythm, the choreography isn’t interesting, and the girls’ CG rendition is too different from how she looks outside CG scenes. They become way too skinny, among other things. I’ll probably keep watching Aikatsu! because I want to know how it will turn out. I consider Pretty Rhythm Aurora Dream the best show I’ve seen in 2011 & 2012, not only because it exceeded my expectations, but also because it was genuinely awesome. I mean, I don’t only like it because it was better than what I imagined, the show IS great. 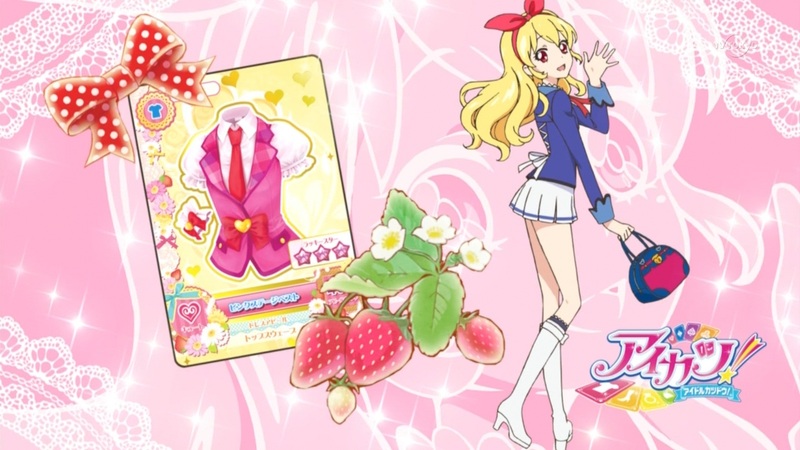 It would be great if Aikatsu! manages to transcend being an anime directed toward little girls and incorporates great and touching story elements like Rizumu’s issues with her mom in Pretty Rhythm. This entry was posted in Aikatsu!, Opinions on..., Pretty Rhythm and tagged Aikatsu!, Arcade Game, Bandai, Opinions on..., Pretty Rhythm, Pretty Rhythm Aurora Dream, Pretty Rhythm Dear My Future, Takara Tomy on October 11, 2012 by rockmanshii. The girls sparkle, brilliant stars shining in their eyes. The girls dance, their hearts overflowing with dreams. The girls sing, their melodies chasing after a boundless future. 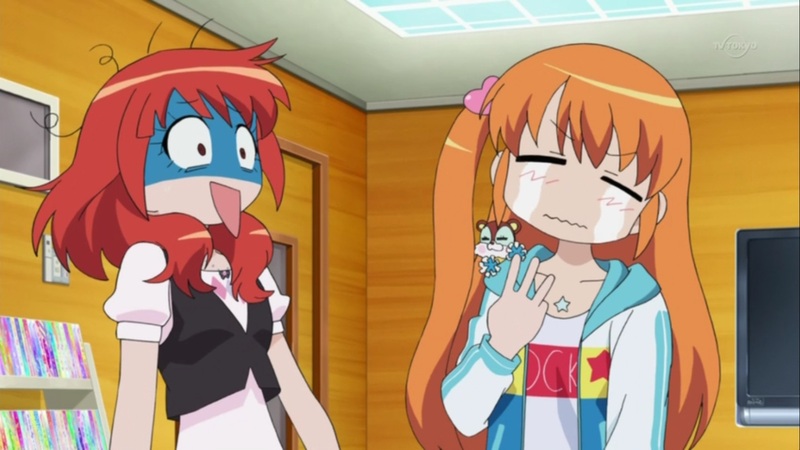 From right to left: Rhythm, Aira and Mion. 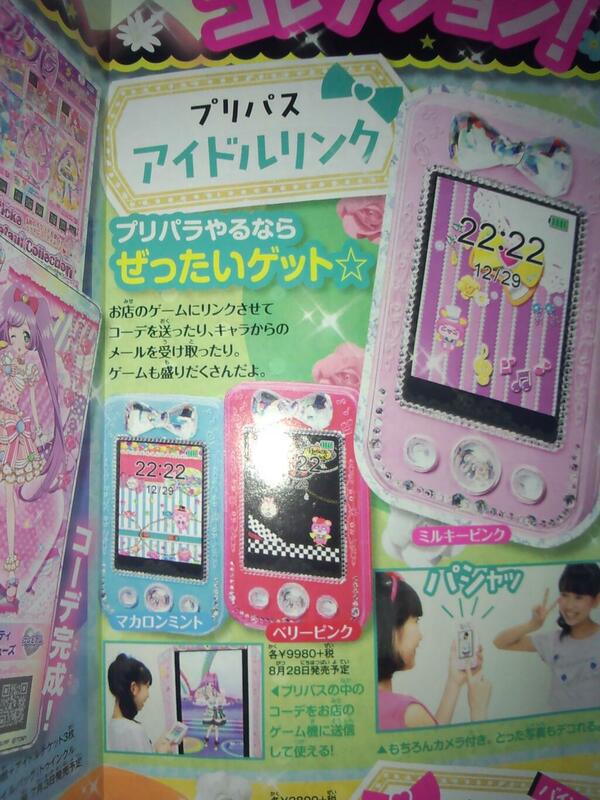 Pretty Rhythm Aurora Dream is an arcade game aimed at little girls by Takara Tomy. The game is pretty similar to Oshare Majo Love & Berry if you know about it, you dress up the girls with previously won e-cards (you get one for free if it’s your first time) and play a rhythm game. You can see some game footage here. I actually wonder if Takara Tomy made Pretty Rhythm to counter OM L&B’s popularity. Well anyway, the anime currently airing with the same name is an adaptation of this game. It’s about 3 girls who sing and dance in a show called Prism Show, and does special moves called Prism Jumps, making people happy. Just like the concept behind real idols (beside making some sweet cash). Still it’s different from Idolm@ster for various reasons I’ll type about later. Aira is the main character, she’s your typical sports heroine who’s clueless but got some awesomazing talent for some reason. To put it bluntly, this is the kind of show most people will dismiss as crap without a second thought. I’m watching it (I’m currently at episode 10) and I must say I was surprised, in a good way. Except for the fact that there’s almost no animation, when there is, it’s good, the CG dance choreography is pretty well done, blend in well, and the story’s pretty good too. For a sports anime for little girls I dare say it’s pretty decent, if not good. Making the characters express their expressions in whacky manners, making them into SD, making them stand up and fall pretty fast, speedlines to make them go from a place to another, (instead of animating actual walking)… Also, every non-important character is silhouetted even if they do have voice actors. Those are nice ways to hide to the audience the fact that they save money on the animation, at least it works perfectly on kids, (I’m pretty sure I didn’t pay attention to such details or animation in general when I was kid at least). Though I’m saying this, I don’t consider bad animation as a flaw, as long as the story is okay, and I gotta say it’s pretty good. It’s the generic story of a sports anime, but mastered. The heroine who tries her best, the hardworker type who at first doesn’t like the heroine because of her talent from nowhere, 3 boys rivals, a tournament arc, etc. Hell, it had one of the same plot twists featured on Tiger & Bunny (but then again T&B got a pretty generic story, but perfectly executed). Now, what’s the difference between this and the currently airing Idolm@ster anime? This is aimed purely at little girls while Idolmaster is aimed at old geezers. The girls are pretty cute and all and wears frilly costumes but there’s not a single drop of sexual fanservice. There’s also an educational side to this anime, they genuinely try to make the audience learn things about fashion, dancing and make them interested in it. There’s nice tidbits too about an idol’s life, like how they shouldn’t neglect their studies. That episode where they showed Aira and Rhythm studying was very cool, especially the English scenes which were pretty nice. I could say more but I actually don’t watch Idolm@ster so I’d rather refrain myself comparing the two anymore. Well that’s it, if someone’s reading this I’d recommend this show to you if you like sports anime with cute girls. FFFpeeps is subbing it, slowly but surely (if only someone would sub Hyouge Mono *sigh* …) I really enjoy it and I enjoyed typing this too so I hope you enjoyed reading this. Have a nice day. Oh and the Opening is a total earworm and I can’t stop humming it. 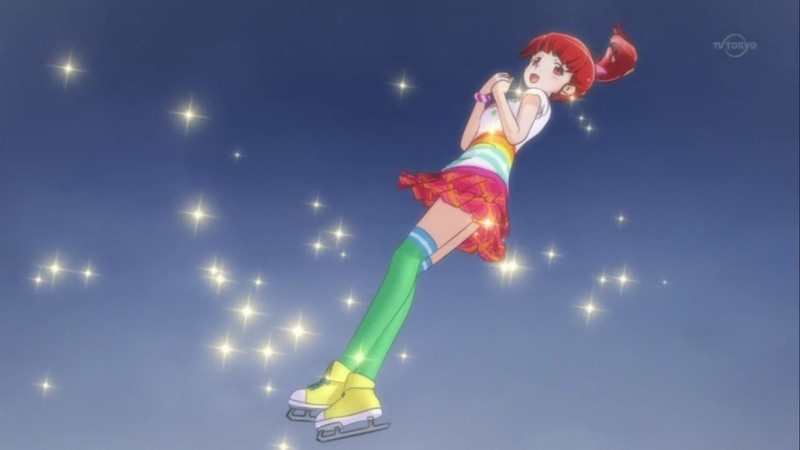 This entry was posted in Games, Opinions on..., Pretty Rhythm, Reccomendations and tagged Opinions on..., Pretty Rhythm Aurora Dream, Takara Tomy on September 1, 2011 by rockmanshii.